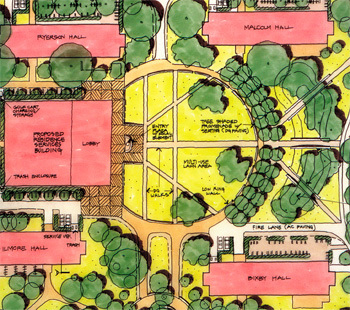 The Segundo Precinct plan addresses the needs of first-year student housing, including existing and new housing, a new dining commons, and a new residential services building. 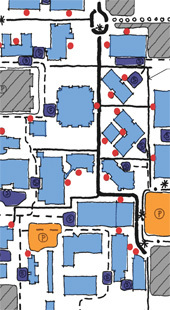 The plan analyzed circulation and open space, pedestrian and vehicular travel, lighting, and signage. The Health Sciences Design Guidelines focus on the major pedestrian linkages, loop road, sub-area entries, and district open spaces. Recommendations address district paving, lighting, planting, and site furnishings. Guidelines also cover conceptual design for the district pedestrian spine, loop road streetscape, and entries.